But the facts are not the only losers here. This group (and as I said earlier, I know a number of people involved with it) made a terrible mistake in associating themselves with the Turkish IHH. One of FGM’s strengths was its commitment to non-violence. Apparently, from what the media has reported and from what I’m told, they themselves stuck to it on this mission and instructed their people to use non-violent resistance. But the IHH has its own program, and they most certainly are not committed to non-violence. Again, the media reports and my own sources seem to indicate the IHH was much more prepared to use violent tactics in resisting the Israeli assault. The fact that it happened that way opened the door for criticism. It clearly escalated the situation and will forever reflect on FGM. No matter what they do, it will be impossible for FGM to portray itself as a non-violent group again. And that was an important tool in their PR kit. The intense criticism Israel has faced is reflective of the new realities of the world. Operation Cast Lead, in fact, was a turning point. With the exception of the United States, the world is no longer prepared to accept that Israel’s use of overwhelming force against much weaker opponents or even civilians is an act of “self-defense.” The condemnation by virtually the entire western world outside of the US shows how thin this argument has become. And even in the US, defense of Israel is far less universal than it has been in the past. Israel’s relationship with Turkey, which before Cast Lead was easily Israel’s closest ally in the Muslim world, may have been dealt a crippling blow here. It certainly has been badly damaged. Israel may not mind. The current leadership may well have decided that the growing and already strong influence of Islamist parties in Turkey make it an ally whose friendship may require a price they don’t want to pay. Certainly the treatment of the Turkish ambassador at the beginning of this year by the Israeli Foreign Ministry supports this notion. Israel may believe it can force the US to choose between itself and Turkey somewhere down the road if relations continue to degenerate, and they may be right about that as well. But the increasing tension between the two countries obviously impacts Israeli security quite negatively. Turkey has been Israel’s only military ally in the region, and the two countries have cooperated in many military exercises, as well as in water projects, and in other forms of economic, military and political cooperation. All of this is in peril. That’s an effect that many see as very bad for Israel, but perhaps Israel does not. Many of us also believe that the determined effort to eschew diplomatic solutions with Iran and pursue sanctions that are not likely to deter the government but will hurt the Iranian people is a bad idea. But Israel has pushed hard for it. This too is now in jeopardy. UN discussion of Iran sanctions have been pushed to the back-burner, and UNSC member state Turkey may now work against it at the UN rather than limiting its efforts to fostering alternatives. This may affect the cooperation the US has managed to get from Russia and, especially, China, whose acquiescence to sanctions was not very sure in the first place. That is all aside from Israel having taken another big step toward becoming an international pariah. The siege on Gaza has done nothing whatsoever to advance Israeli security. On the contrary, it has actually made it much harder for Israel to monitor what goes into the Strip by vastly expanding the tunnel economy and widening the opening for weapons smuggling. It has strengthened Hamas’ hold on the territory. It has inflicted enormous and needless suffering on the people of Gaza, making Israel look cruel to the rest of the world. And, as a form of collective punishment, it has demonstrated Israel’s contempt for the rule of law. The flotilla’s very existence and the disastrous incident this past weekend are the fruits of that poisonous tree. They were the biggest winners from this whole incident. The controversy over this incident has sparked by far the most diplomatic activity around the globe to lift the siege of Gaza. The IHH represents conservative Islamist forces within Turkey and come off as the heroes in this affair to many, both in Turkey and around the world. The IHH’s connection to terrorist groups is not proven, but ideologically, they make no secret of supporting Hamas and other Islamist groups. 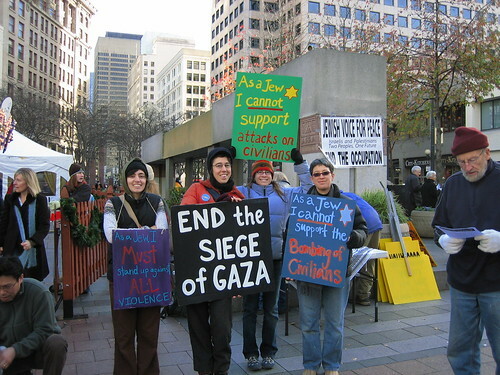 By striking a blow against the Gaza siege, they greatly increase their standing among their supporters and potential supporters. The IHH was operating with the sanction of the Turkish government, which, despite earlier confrontations including arrests, considers it an NGO, albeit one they may not like very much. There is no doubt that this action will make it much harder for the Turks to sideline IHH politically. Statements from Vice President Joe Biden, House Majority Leader Steny Hoyer, Representative Anthony Weiner and Senator John McCain, among others, supported Israel’s action virtually without qualification. These voices are reverberating throughout the Middle East, and the response in the Arab and Muslim world will be that the US has once again shown that it will support any and all Israeli actions, no matter what. The Obama Administration, though, is coming off looking much worse. Obama seems to be trying to play toward a middle ground. He is not offering the unqualified support his Vice President is, but he is not seriously criticizing the Israeli action either. The US worked hard to water down a Security Council statement. But they’re also pushing for a transparent and independent investigation, to be carried out by Israel. That is not sitting well with the Netanyahu government, yet it is also well short of the international investigation the rest of the world prefers. And therein lies the problem with Obama’s response here. He is not playing the AIPAC line and Jewish groups are disappointed he’s not doing more. But he’s also positioning the US outside a global consensus on this. Thus, he’s trying to keep everyone calm, but pleasing no one. Some may consider that smart politics in an election year. But the result will be a loss of credibility in the Arab world and no commensurate gain among Israelis. And it projects very weak leadership, which will be detrimental to the President not only in the international arena, but here at home as well. The Republicans, with McCain leading the charge, smell his blood in the water on this issue and Obama is not doing himself any favors with his middle of the road stance. Part of the problem may also be the position of the Palestinian Authority. Obama is surely concerned that if he condemns Israel it will increase the already great pressure on Mahmoud Abbas to abandon any talks with Israel, proximity or otherwise. Obama worked too hard to get even the little bit he has to risk losing it in a day. Bibi also comes out looking very bad here. Even those who believe Israel should have confronted the flotilla agree that this was handled very badly. And, back to an earlier point, Bibi’s government was well aware the IHH was involved in this effort, and if they’re the terrorists Netanyahu is now saying they are, why are the commandoes saying they were not prepared for serious resistance? No matter where you come down on the wisdom, ethics and legality of this operation, it was clearly an intelligence failure and an operational one as well. Bibi has presided over too many of these debacles (can anyone forget the botched 1997 attempt to kill Khaled Meshal in Amman, which threatened to torpedo the still very young Israeli-Jordanian peace treaty, and led to Israel releasing Hamas’ leader at the time, Sheikh Ahmed Yassin?). They seemed to have a golden opportunity to enhance their standing, but seem now to want very much to throw it away. It’s all well and good that they want to publicly defend the flotilla activists, but refusing the delivery of the seized materials from Israel betrays once again the lack of concern Hamas has for the conditions in Gaza. Still, the action strengthened Hamas’ position, on the whole. Whether or not they can do anything with those gains remains to be seen. There are many calls now for an end to the siege of Gaza. The New York Times editorial page called for it today. Tony Blair, the Quartet’s representative, did so as well, as did England’s First Secretary of State, William Hague. And statements calling for the end of the blockade came from the EU and UN Security Council. In the last analysis, this means that the flotilla accomplished its goal beyond anything it could have reasonably hoped for. For three years, Gaza has been under siege. Three years where that siege has done nothing to stop rocket fire, to stop Hamas increasing its military capabilities, to weaken Hamas’ hold on Gaza or to help free Gilad Shalit. Yet for those three years, the world has been remarkably silent. The calls today for ending the siege make this day louder than all the days of the past three years combined. Right now, Netanyahu is standing fast, stamping his feet and saying he “won’t do it no matter what you say.” But the reality is that Israel has very little stake in the siege. At one time, both Israel and Egypt hoped that the blockade would prevent Hamas from gaining legitimacy as a government. They did not want to see Hamas graduate from terrorist group to legitimate political players as so many other groups (the ANC, Sinn Fein, the FLN, and yes, even the pre-state Zionist Revisionist militias, the Irgun and LEHI, from which two future Israeli prime ministers came) have. But, as with other goals of the siege, the opposite effect has come about. Hamas has withstood the siege and more and more voices are urging Israel to talk with them. The attempt to, as Dov Weisglass once said, “put the Palestinians on a diet” has failed. The Gazans did not rise up to overthrow Hamas. But there have been indications that Gazans are not so thrilled with Hamas. Historically, outside pressure causes people to support, not overthrow, their governments. A lifting of the siege might well expose more dissatisfaction with Hamas than many might believe. In any case, the siege has failed on a practical level, and was always a calamity on a moral one. It’s time for it to go. This entry was posted on June 3, 2010 at 12:48 am and is filed under Uncategorized. You can follow any responses to this entry through the RSS 2.0 feed. You can leave a response, or trackback from your own site. 3 killed on the exodus by the Royal Navy; 9 killed on the Marmora by the Israeli Navy. Anything you can do, we can do better ! israel allows freedom for journalists… oh yeah ? where were the 16+ journos of the free gaza fleet when israeli gvt declared its “innocence” ? Yaroni is wrong. A state, in a time of conflict, can impose an embargo, and while it cannot carry out embargo activities in the territorial waters of a third party, it can carry out embargo activities in international waters. Within this framework it is legal to detain a civilian vessel trying to break an embargo and if in the course of detaining the vessel, force is used against the forces carrying out the detention then that force has every right to act in self defense. There is a long history of embargo activities in international waters. Further, Rule 67(a) that Jacob sites applies to merchant vessels in a war zone. Note clauses c and d in particular. The intent of the law is clear. The establishment of a blockade, which itself is of dubious merit in this case, does not entitle the blockading country to abandon all restraint, nor does it extend their arena of operations indefinitely without just cause. If the San Remo manual is pertinent, then Yaroni was wrong to write that Israel had no right to enforce the embargo in international waters. Ignoring the fact that Hamas is in a state of war with Israel and is doctrinally committed to its destruction, betrays a huge anti-Israeli bias. That state of war is the reason for the Israeli embargo. The fact is that the Israeli navy took over five ships of the flotilla bound for Gaza. The activists on those ships protested peacefully. There was no violence and nobody was hurt. But, some of the passengers of the sixth ship, the Marmara, mounted a violent resistance. They had bats, iron bars, knives and slingshots with glass marbles. They assaulted every soldier as he slid down from the helicopter. The soldiers were under orders to not use their handguns unless their lives are in danger. Seven of them were wounded. One suffered a serious head injury, two others were injured by gunshots, two more were stabbed in the abdomen and two other had broken arms. Only then did they use their handguns and responded to the violent attack against them. The unfortunate loss of life was a direct result of the violence used by the extremists on the ship. And the flotilla had nothing to do with delivering humanitarian aid to Gaza, for the organizers pointedly refused an Israeli request to sail the ships to Ashdod, a port from which the goods could have been delivered to Gaza after inspection. It was a cynical political step and unfortunately Israel was not prepared and fell into the trap. And, Yaroni should take note of the amounts of provisions Israel allows to enter Gaza. In the first week of May alone: More than 375,000 gallons of gasoline for the power plant. 70,000 gallons gasoline for cars. More than 900 tons gas for cooking,. 76 trucks with fruits and vegetables. 92 trucks wheat, 76 trucks, meant, poultry and fish, 39 trucks of milk products, 112 tracks with animal feed, 26 trucks with hygiene products, 46 trucks dresses and shoes, 30 trucks sugar, 7 trucks with medicines. Israel’s record of promising much and delivering little does not leave me convinced that if the goods had been delivered to Ashdod they would have reached the citizens of Gaza very promptly. Israel offered to the organizers to have their representatives present during the delivery to Gaza. In the meantime the Hamas is refusing to accept the goods.